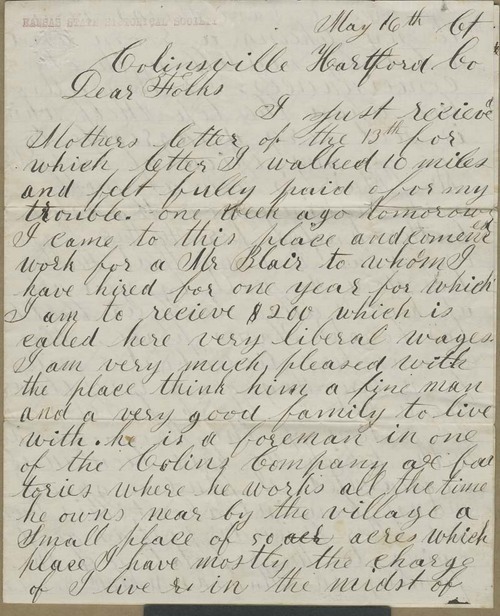 From Colinsville, Hartford Co., Connecticut (most likely, May 16, 1857), Oliver Brown wrote to his family regarding his current employer, "Mr. [Charles] Blair," who had agreed to pay Oliver $200, plus room and board, for one year. "Mr. Blair is now at work making 1000 Kansas butter knifes for Father," wrote Oliver Brown. He mentioned the presence of Brown relatives in that area and the favorable "reputation of the family [Browns] in Kansas" reflected among the residents there.